As quick and easy as my dish is, I shall also make a quick post as we are leaving for a few days. We are going to Sparta to our relatives and shall be back next week. Yesterday, morning we left for the Lake without preparing anything for lunch, so on our way back we stopped at a big supermarket. I wanted to buy some fresh fish, which would be easy to grill but I didn’t like what I saw, nor did I like the meat. Instead I grabbed some baby kalamari, mussels (or is it clams, I am not sure of the difference because in Greek they are both called μύδια? I think they are mussels because they were orange in colour) and scallops and for pasta I chose penne. When we came back I made a quick google search with the four ingredients and found this recipe. I had no sun dried tomatoes or shrimps or fresh basil. Why would I add heavy cream in a nice light dish like pasta? And why add chicken broth in a fish recipe? Although I had some heavy cream home I skipped this ingredient. All seafood ingredients were frozen and I did not have a lot of time to thaw them. The scallops and mussels (clams?) it was easy to get half of the quantity from the package. The kalamari gave me a hard time as there was too much ice but with a sharp knife I managed to cut half the quantity and put all in a bowl with water. By the time I had my shower and washed the swimming costumes and towels the ice melted. This is my version, which turned out great. However, if you like the original one you can still do it. In a large skillet add olive oil reserving a few tablespoons. Sauté onion and garlic and add seafood. Sauté again for a few minutes and add wine. Meantime peel the tomatoes and after blending add to the skillet and mix. Add oregano, basil, salt and pepper. Cover with lid and simmer for about 20 minutes until seafood remains with just a little sauce. Meantime boil water, add salt and cook pasta, al dente, according to the package. Twenty minutes is more than enough. While pasta and seafood are cooking, in a separate non stick frying pan add the remaining oil. Clean mushrooms with kitchen paper, chop and sauté them. Add the peppers and sauté for a few minutes as well and remove to the platter. When pasta is cooked, drain and mix with the seafood in the skillet. Finally add the mushrooms and peppers and mix. Serve with some parsley on top. 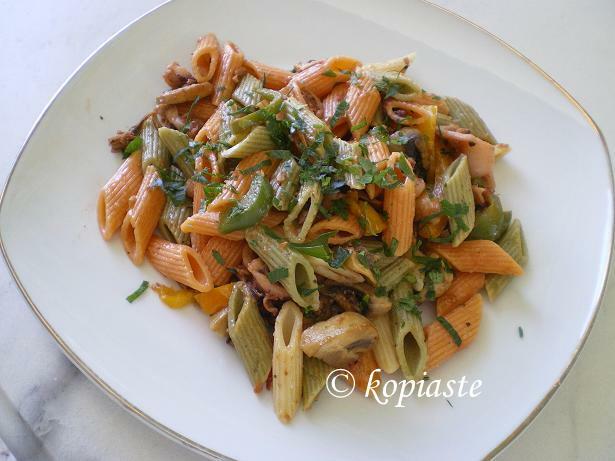 As lots of children are not fond of mushrooms and peppers, remove some after mixing pasta and then mix in the peppers and mushrooms, for the remaining family. It does look wonderful, and I’m with you…why would you want to use chicken broth with all that tasty seafood. Thanks for sharing with Presto Pasta Night. It will be first up next week. Have a great visit and raise a glass for me! Hi Ruth. That was quick. Thanks a lot. We are leaving in a few hours and don’t know if I will have access to internet but if I do I shall publish the comments or else when we come back. See you soon. Great seafood pasta Ivy..I’m not the biggest seafood eater but that looks delicious…I also agree about the original recipe…why would you add chicken stock? Peter, thanks. Ι am glad you agree as well. Good move on skipping the chicken broth and like most frozen seafood medleys, it’s likely mussels in the mix. Mushrooms and seafood seem to go really well together. Enjoy the weekend and take a “voutia” in the sea for me. this is so mouth-watering!! seafood and penne are truly perfect combo!! i’m loving it! great presto pasta entry! Your kids don’t like mushrooms and peppers? I love them, especially in this pasta. It looks truly delicious, Ivy. Delicious Ivy – I love the coloured pasta that you used for this. Cream is unceccesary, I agree. I love this combo of seafood and pasta.Have a safe trip. Hope you’re having a nice visit! That looks great and I hope you have a great trip! Hi everybody and thanks for your wonderful comments and wishes. We had a nice time and rested for a few days. We arrived late last night and have tons of work to do but hope to visit it you all soon. I love mushrooms and peppers, so I always add them where I think they would go well with other ingredients and the dish was excellent. Oh yum! I would love to eat this. I keep seeing dishes with calamari in it and I want to try it myself. Kind of scared of it, though. I think clams have white shells and mussels have dark shells. From what I can see in the picture, I think you’re right – they’re mussels. Hi Psychgrad, just went away for a few days and I’m back again until we leave again. Hope you’ll try it because it is delicious. This must be a sumptuous dish. I love the Agaricus mushrooms and the kalamari and mussels as well. Thanks Gay. These mushrooms are very good, I’ve tried them in several dishes.